Home News North West Centre for Advanced Manufacturing – University of Glasgow developing solutions to industry challenges. World leading researchers at the James Watt Nanotechnology Centre, University of Glasgow are partnering with Northern Ireland companies in the life and health science sector to boost industry-focused research in advanced manufacturing. The collaboration is being facilitated through the North West Centre for Advanced Manufacturing (NW CAM), a cross-border consortium supported by SEUPB managed INTERREG VA funding of €8.7m. Led by Catalyst Inc, NW CAM is delivering fifteen individual doctoral level R&D projects by applying advanced manufacturing technologies to enable the development of new and innovative products and processes. The program aims to create a step change in global manufacturing competitiveness and strengthen regional economic development and impact. The Centre has four academic partners, University of Glasgow, Ulster University, IT Sligo and Letterkenny Institute of Technology working alongside a number of start-ups, SMEs and multinationals with the reach of the Centre spanning the West Coast of Scotland, Northern Ireland and border areas of Ireland. One of NW CAM’s key objectives is to integrally link applied research to specific industry challenges, resolving real-world problems and opening access to research expertise and equipment. Discussing the model, leading Glasgow academic Prof. Steve Beaumont describes NW CAM as “Helping to bring academic institutions and businesses together at an earlier stage in the manufacturing process”. 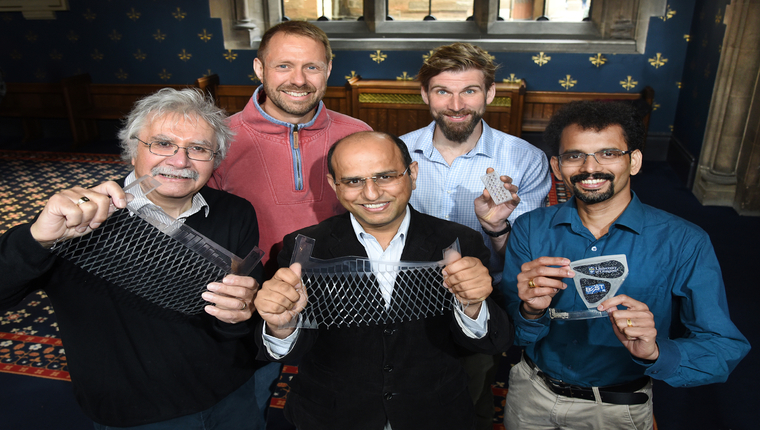 Professor Beaumont and his team are collaborating on three projects, two with NuPrint Technologies in Derry~Londonderry led by Prof. Ravinder Dahiya and one with Causeway Sensors in Belfast led by Prof. Nikolaj Gadegard. The NuPrint projects focus on printing of electronic layers and devices on flexible substrates and developing smart printed RFID sensor tags for health monitoring. Both address the widespread problem of medication errors and improving the safety of vulnerable patients. Managing director of NuPrint Technologies, Gavin Killeen highlights the benefits of partnering with the University of Glasgow. He says “These projects have the potential to transform the scope of conductive labelling and ensure that NuPrint Technologies are the vanguard in this technical development and application to create more innovative products and solutions”. The central focus of the Causeway Sensors collaboration is to develop integration of injection moulded plasmonic nanostructures into a point of care biosensor device. Glasgow researcher, Dr Johnny Stormonth-Darling, is designing a solution to address rapid patient diagnosis of potentially fatal conditions such as sepsis. Speaking about the project, Dr Stormonth-Darling says “The opportunity to work directly with business gives my research a direct application which is very exciting.Within NW CAM the positive relationship of co-designing a solution with our partner is very rewarding”. These unique partnerships highlight that innovative advancements in manufacturing practices can be maximized through applied research and knowledge sharing. NWCAM provides the translational infrastructure to make this happen. NWCAM is currently conducting a regional survey to better understand how it can support industry. Please click here to complete the survey. In return we will share our key findings with you.